Utilizing iterative development cycles based on a customer feedback driven development model, Cannabase has revolutionized the technological landscape of Colorado’s legal cannabis market. Founded in 2014, Cannabase quickly catapulted to the top of the B2B space with the largest marijuana wholesale market & private network for Colorado’s licensed marijuana businesses. Without missing a beat, the product has expanded to a fully integrated platform that integrates this powerful business hub with a cutting-edge mobile dispensary finder that can be enjoyed by users and non-users alike. Cannabase is a fully responsive browser based application, meaning you don’t have to visit any app stores to get started! Just open cannabase.io from your smart phone, tablet or computer and start exploring! Be sure your browser of choice is updated for the best Cannabase experience (we recommend Chrome). Cannabase is optimized with on-the-go mobile notifications! All Cannabase users will be notified of new messages from approved friends, and in the marketplace, notifications can be applied to all wholesale requests – so you know exactly when something you’re looking for hits the market. Your in-app message center is built for single or group instant messaging. 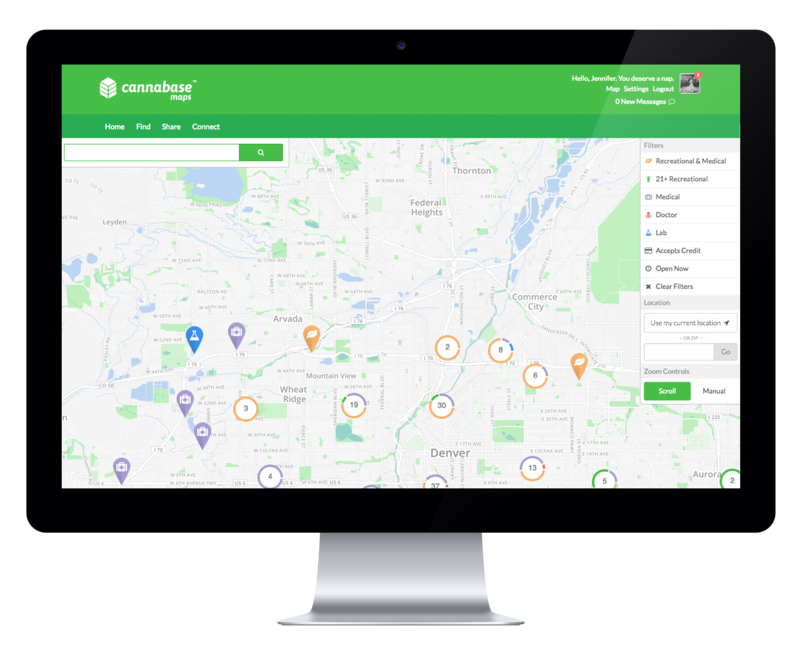 Businesses can conveniently start a group chat with their employees, connect over listings or requests, and connect with consumers via Cannabase Maps. Cannabase’s primary focus is on industry-leading technology built with the end user in mind. We build iteratively – meaning we’ll evolve with our user base (and won’t always be perfect) – but we’ll grow based on what’s actually working (and the feedback you give us). Cannabase Maps™ is a public-facing, highly-dynamic dispensary finder, allowing consumers to find and filter shops by name, location, store type (recreational/medical), open/closed, or cash only. Users signed into their Cannabase Connects account can interact with Cannabase Maps storefronts by favoriting, leaving reviews, grabbing deals, messaging the store, and more. Cannabase Marketplace™ is a private network for licensed marijuana businesses, centered around an industry-leading wholesale marijuana marketplace. Users enjoy access to exclusive Cannalytics™ market data, business profiles with employee accounts, secure messaging, automated product notifications, and robust set of opt-in marketing tools to help business owners instantly reach & engage Cannabase Maps users. Cannabase Reach™ allows ancillary businesses, investors, activists and community members access to Cannalytics™ market data, virtual storefronts, and display advertising in the industry-leading Cannabase Marketplace – a powerful hub of licensed owners and operators.